CHICAGO (September 11, 2014) – This year’s Backer’s Total Pet Expo will feature a press luncheon on Saturday, September 20, 2014 at 12:30 p.m. in the Media Room during which they will announce the winners of three major contests at 1:00p.m. : Pet Product Showdown, All Natural Contest, and Product Innovations Contests. Total Pet Expo media spokesperson and TPE TV host, Kristen Levine, from Kristen Levine Pet Living will serve as the luncheon emcee. The Pet Product Showdown contest begins at 10:00 a.m. at the Pet Product Showdown Contest Area on the show floor. The contest is open to any exhibitor at Backer’s Total Pet Expo and is free to enter. Show attendees can watch contestants deliver a 2-minute pitch about their new product to a panel of judges. The contest winner will be announced during the reception and will receive a prize package valued at over $10,000 that includes PetPR.com public relations services, a video commercial produced by ReelPaws, a full page ad in Pet Age Magazine and exhibit space in Backer’s Total Pet Expo 2015 trade show. The All Natural Contest was conducted via Backer’s Total Pet Expo’s Facebook page prior to the show and voted on by the general public. The top 10 products will be featured in the All Natural Area on the show floor and announced during the luncheon. The Product Innovations Contest winners are chosen from the Product Innovations Area with three special recognitions awards from Pet Age Magazine. All three winners will be announced during the luncheon. The press luncheon is just one of many changes made to Backer’s Total Pet Expo this year. Earlier this year, Backer’s Total Pet Expo announced a transition to a one-floor show layout in a larger hall at the same convention center. And the show will debut a new app for smartphones and tablets from iTunes and Google Play that includes exhibitor and attendee locators, schedules, speaker bios, maps, a QR scanner, photo gallery, social media links and Click, an interactive scavenger hunt game/contest. All credentialed media and invited guests are welcome to attend the free Total Pet Expo press luncheon. To RSVP or request invitation to this event, please contact Andrea Fischetti at info@reelpaws.com. 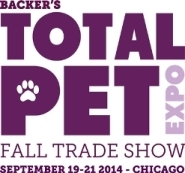 The annual Backer’s Total Pet Expo will be held September 19-21, 2014 at the Donald E. Stephens Convention Center in Rosemont (Chicago), IL. Total Pet Expo is the pet industry’s premiere show bringing pet product companies and buyers together in a venue that offers both networking and educational opportunities. In 2013, Total Pet Expo drew 408 exhibitors in 693 booths and more than 6,500 retail buyers from around the world. For more information, please visit www.totalpetexpo.com or call (312) 578-1818. Total Pet Expo has designated ReelPaws Productions (www.reelpaws.com), the only production company in the country focused exclusively on pet industry businesses, as the show’s official Media and Production Partner. ReelPaws Productions’ video marketing campaigns have earned attention from some of the largest and most innovative names in the industry. To date, the company has created video campaigns for more than 750 pet products, filmed more than 1,000 animals, with its work appearing on a range of industry and consumer websites and TV stations. In addition, Total Pet Expo has designated PetPR.com (www.PetPR.com) as the official news distribution service for Total Pet Expo’s exhibitors, offering exhibitors a promotional discount on PetPR.com’s editorial and proprietary media distribution services. About H.H. Backer Associates Inc.
For more than 40 years, H.H. Backer Associates Inc. has been at the forefront of the pet industry with record-breaking attendance at its trade shows and educational conferences. As a highly respected and progressive force in the constantly evolving pet industry, H.H. Backer Associates Inc. delivers quality buyers and quality results at its annual Total Pet Expo. Connect with H.H. Backer Associates on Facebook or Twitter (@TotalPetExpo).